I am pretty darn excited about PAX 2014 this year. I won’t be working for a games company, which is odd. But, I will still be there working! And when I say working, I mean working for my own community efforts. I’ll be mostly found up in the Diversity Lounge on the 6th floor, hosting a table for my Meetup.com group, Inclusive Geekery. If you’re looking for Backup Ribbons from the Backup Ribbon Project, I will have them at the table and also be carrying them around! My panel, Building Inclusive Communities in Analog Gaming. 11:30am-12:30pm Hedgehog Theatre (Grand Hyatt 1st floor). YES IT WILL BE STREAMED! WHOOIEEEE! Filling in on the panel, How to Love and Hate Tabletop Games. 11:30am-12:30pm Sandworm Theatre (Sheraton 2nd floor). I do not know if it is streamed. Diversity Lounge (Meetup) – Gay Game Industry Professionals meetup 12pm – 2pm, although it overlaps a little bith with the panel. Diversity Lounge (Game Demo) – Green Ronin’s Dragon Age RPG 2-hour demo 2pm-4pm. I’ll have pre-generated characters, dice, and such for you! Diversity Lounge (Game Demo) – Marrying Mr. Darcy! I’ll be teaching the game from 10am-12:00pm. 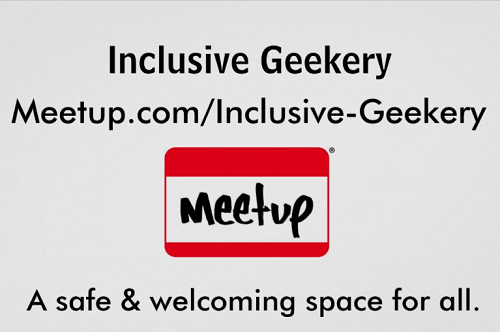 Diversity Lounge (Meetup) – The Pink Party Prime pre-party meetup! 5pm-6pm! Of course, I’ll be supporting lots of local inclusive groups who will drop flyers off and such. Plus, I’ll definitely be bringing information about OrcaCon 2016! Please drop by and say hello!